msliz When I saw your doodle pop Chinese food I had to order it. We had Chinese food for Christmas dinner and while I took no photos, that little pop will go with the journaling. You inspired me! Of course I had to add a few other things to cart to capitalize on the $3.99 shipping. Gorgeous work ladies! So inspirational! elaynef love seeing your pages! You, linda, and nylene remind me of my love of 8.5x11 and you all do so much with that size! I have sucked as a team member this month. I haven't scrapped a lick but have a few points for organizing. Sorry guys! One more for 12 Days of Christmas. This is for #7 Bundled up. Will add points on other thread. Old photo challenge 9pts (53 years old) I was considering using this old one in my valentine decor, but couldn't find and frame and don't know where to put it so I stuck it in an album for safe keeping. looking for pictures, framing them and decorating for valentines day.Not finished with my valentines stuff, but letting it marinate! nylene, that page is lovely! 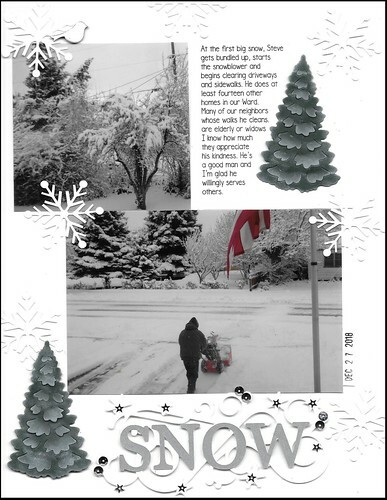 Would not have thought of grey and white for a winter page, but it is perfect! Will look at it in detail in the Gallery. elaynef, that is a lovely wedding photo. That Game Room page is cool. I like the cluster in the corner. Love your Valentines' decorating. I just finished putting away Christmas, so don't think I will be decorating much for the next little while. 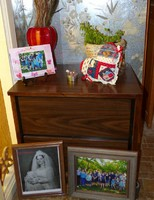 I have photos and papers pulled out. My physio appointment is not until noon tomorrow, so hoping I can put together a couple of pages before then. elaynef , you have been a scrapping MACHINE this month!!! 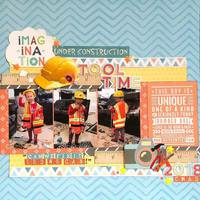 Love the background papers you chose for these pages: perfect for each of the themes! 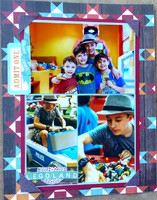 Great excitement on the Legoland page, and I love all the peaceful blues on the snowy page. I never know what to do with those papers with the whole scene like that, but you have used it masterfully. 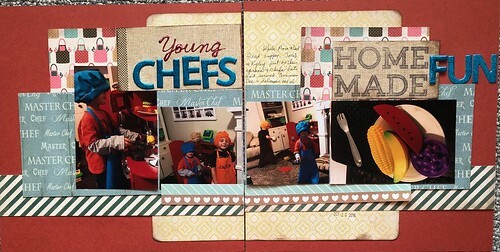 I put together two pages this morning for the weekend kit challenge. 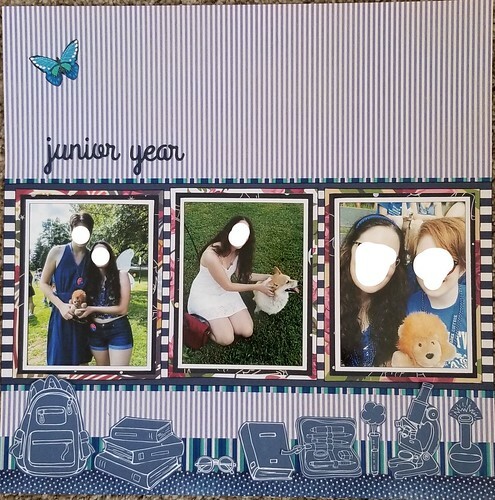 I managed to do some more scrapping tonight, something is throwing me off on this one, so I’ll look at it tomorrow, I think I may replace the journaling block, if I print out journaling, I could make it smaller. I’m loving everyone’s layouts, it’s so fun to get inspiration from this thread!! 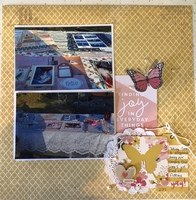 I also managed 3 other layouts thanks to Crystal Bs kit challenge, this was using scraps from one of them. dasmith2 I think the page is lovely, I really love the little pops of colours in the layers and that couch and the "get cozy" are perfect. 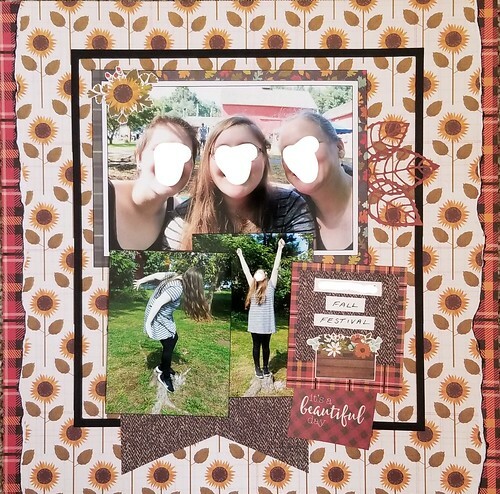 Is the "off" feeling because the journaling block is not connected to the centre block with the photo? You have the hex's going under on the left side but no connection on the right. I'd probably add another couple of hex's on the right hand side, or move the journaling block over to the left a little so it touches the centre column. I've been so happy to be back scrapping again! Here are a few more to share. I'll be back later to fill in the challenge info. julieinsweden 's challenge "S is for Sweden" prompted me to finally scrap some really old photos of a trip I took with my Dad back in 1993. He worked in Saudi Arabia for 3 years from 1991 to 1994. In 1993 I met him and my aunty over in London, where we travelled around the UK, then did a cruise of the Greek Isles, then Dad and I went to Saudi Arabia after a stopover in Zurich. 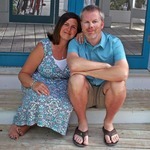 If I have time I will do a few more layouts from that trip for this same challenge: Switzerland, Santorini, Southampton. Points: 1 for the LO, 1 for sharing, #Rectangles, #4 Squares, #6 New stuff (template), #Generations (2), #13 S is for Sweden (2), #23 Manufacturer Mix Up, #27 Metal It Up, #31 Multi Photo, #36 Type It, #37 Journal's Badge, #44 Oldies, #45 Tie One On, #56b Fasten It, #57 Tie It Up TOTAL = 18 points. Wow!!! Lots of activity here in the last couple of days! I will come back later to comment. 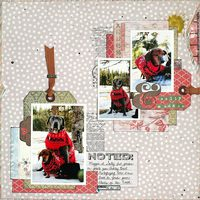 Here is my page for LisaDV's January 19th Sketchy Saturday Challenge. 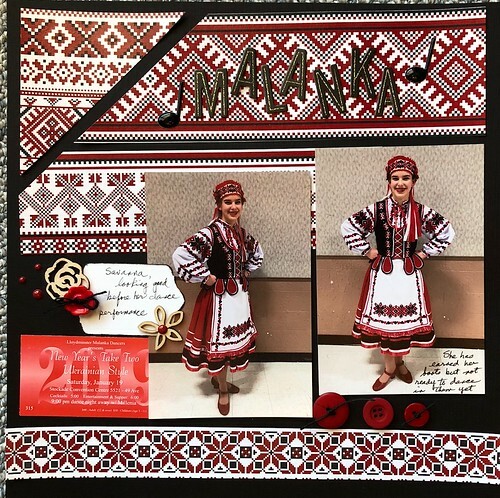 This girl is my niece's daughter and the event was Ukrainian New Years' Eve or Malanka. 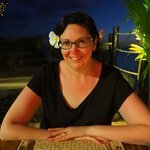 I noticed I am doing the same challenges on almost every layout and ignoring some... going to make a list of the ones I haven't tried yet and see what happens. Don't really like how my Jan 19 sketch challenge looks...that might end up being a redo! dasmith2 , I love the colours and ink spatter on your chillin' with dogs page. I think Chinagirl828 is right: a few more hexagons cascading down by the journaling block will tie it all together. Great pages, KikiPea ! Love the Bob the Builder subtitle, and the cluster with all the tools. What fun out takes! 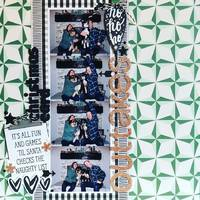 and I love the sentiment block: perfect! msliz you have been busy! Great backgrounds. I love all the grid pages: I have trouble with those, prob b/c I don't get along well with straight lines LOL. But you mixed them up with the tilted photos on the one (perfect with the fun action shots). I like all the different borders: banners or icons, grounding your pages. Not sure what tweaks you made on the Hair pages, but I remember liking them when I first saw them and like them now. AussieMeg , I left you love in the gallery. Great travel pages. I love the angled cuts in that first page, elaynef, and the use of woodgrain. And your grid on the second page really works to fit in all those casual shots. Great colours there, too. Good to see you scrapping again, KelleeM! Love the happy colours in the top one, and the grid pattern with the peaceful blues in the second. What a cutie! 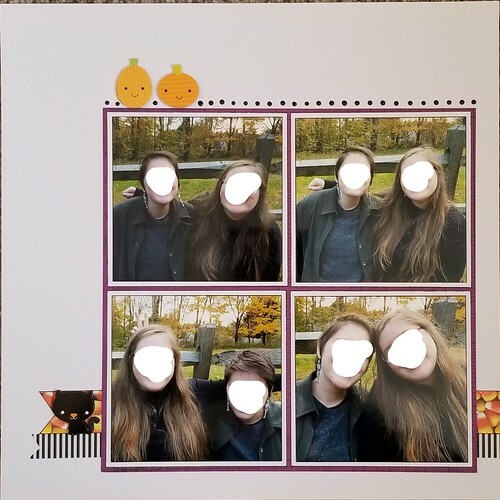 I love how you decorated the squares with no photos: I never seem to be able to get that right. 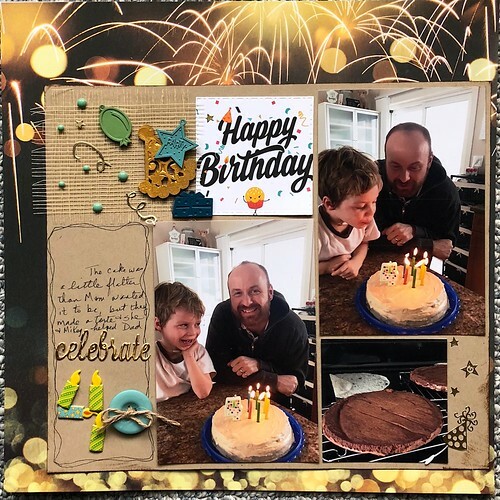 I have a card and another page finished, and I hope to get its facing page finished sometime tomorrow, but it is my dh's birthday and we are going out for brunch. Not sure what the rest of the day will hold, but the scrapping may have to wait until Monday. dasmith2 that re-do looks awesome! I really like that line of hexagons and all the splatters! KelleeM@ love the sunshiney happy colors - especially at this time of year! And the grid on let's read is great! Love all the butterflies. We had that same chair in the 80's! Ahhh the memories lol. elaynef I haven't seen the sketch you used for the grid, but love all the photos you managed to get on it and I really like that PP and the banner flags. 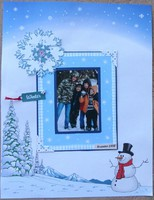 I love the background you used for the lego page, I really like that design and your snow challenge page is stunning! The colors make me think of how hushed things feel when there is a big snowfall. AussieMeg nylene and grammadee there is love in the gallery. 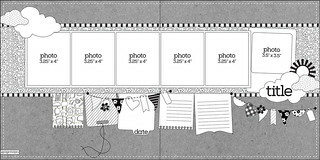 msliz I love that photo grid on your fall layout. So many photos yet they flow so well! And your DD looks like she's a hoot in the Halloween LO lol. I like how clean and simple it looks, and the rows of nuvos. 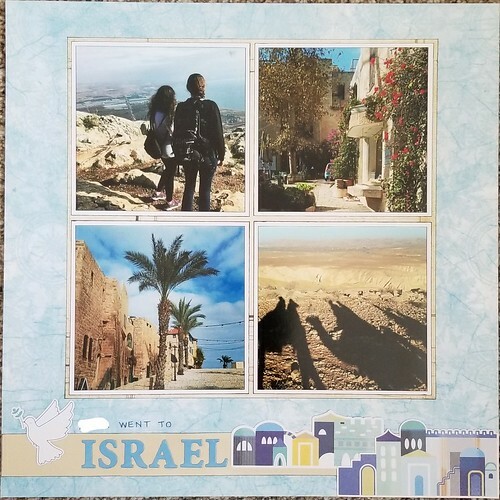 The colors in your Israel spread are beautiful! 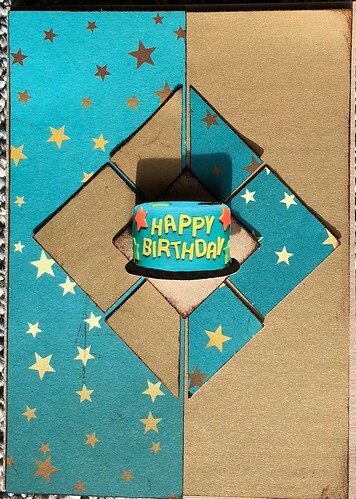 Those diecuts at the bottom are perfect. Love the font on junior year and that paper you used. I'm really loving the blue, the row of icons on the bottom are just perfect. 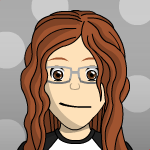 I like the redo you did as well, love the mix of PP and that OMG lol. KikiPea I love love love that Tool Time layout! perfect colors and embellishments! 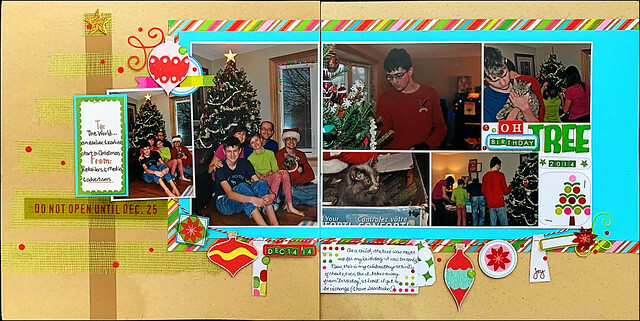 And I love that photo strip on you Christmas LO. I love the way you use some of the papers I struggle with. I've been complaining all month of no mojo and wow, I should have been checking in on this thread! Soooo much inspiration! ARGH! I finally got in here to participate, and I can't get my flicker images to show. I have no idea what changed from December either. Trying again. I am sorry I've been a terrible team-player this month too. But I hope nobody feels the need to apologize for lack of layouts- we are supposed to be here for motivation and encouragement and our own desired level of creation - we all go through ups and downs, and I am most certainly in a DUMP! What I feel most guilty about is not giving as much feedback in the gallery this month or participating as much in threads to be part of the "team", even if I'm not scrapping. These are old photos, 4 years ago (my middle boy has changed. so. much...). In honor of them being so old, I used some old old scraps - echo park pp (the ornaments are cut from it), old thickers, old mesh to make the "tree", old KI acetate. I used a sketch to start me off. I used this sketch to start me off altho it appears I only kept the banners! Great remake, dasmith2 . Take an extra point for that! Challenge #16. Left love for you in the Gallery, kitbop . 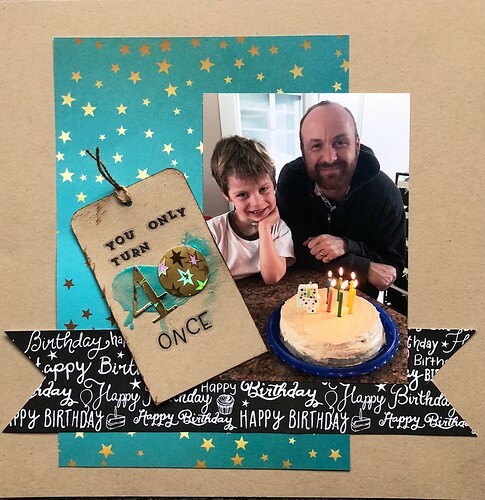 Love the journaling on the birthday page that connects past and present. 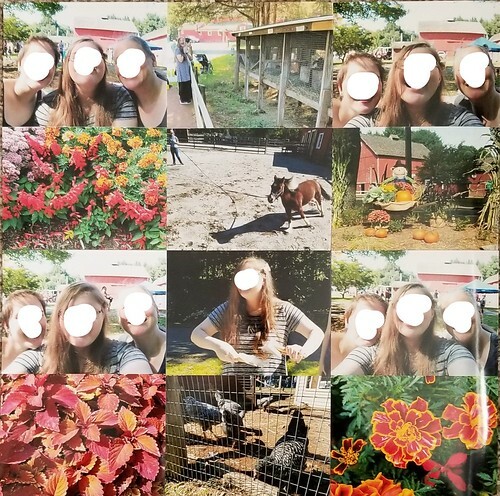 And congrats on getting these 4 year old photos scrapped! And thanks for sharing the sketch for the two pager here and the single page in the Sketchy Saturday thread. Two pages created and shared (4). Sketchy Saturday (Jan 26) (1). Bonus challenge (button) (1). 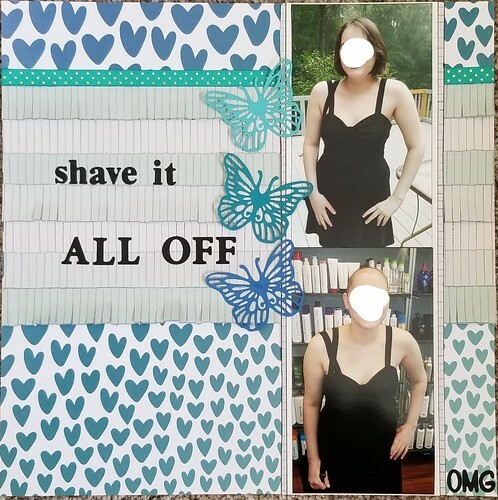 Stash challenge (specialty pp plus handwriting) (1). 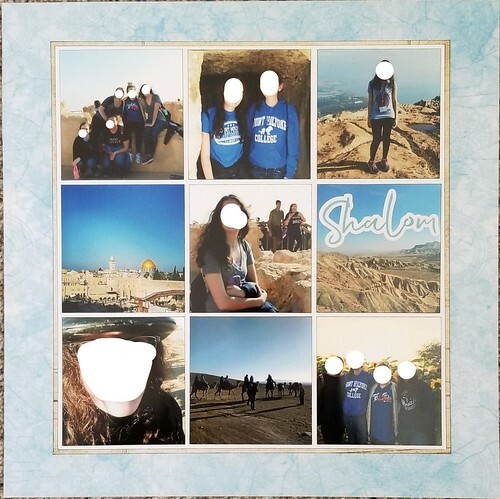 #3 rectangular photos (2). #4 square pages (2). #6 new Reminisce birthday collection (2). #8 two generations each page (2). #9 clusters (1). #15 dots (1). #24 dies and punches (2). #25 diecut word (1). #27 brads and charms (1). #31 3+ photos on one page (1). #37 journaling (1). #45 twine (1). #57 bow (1). 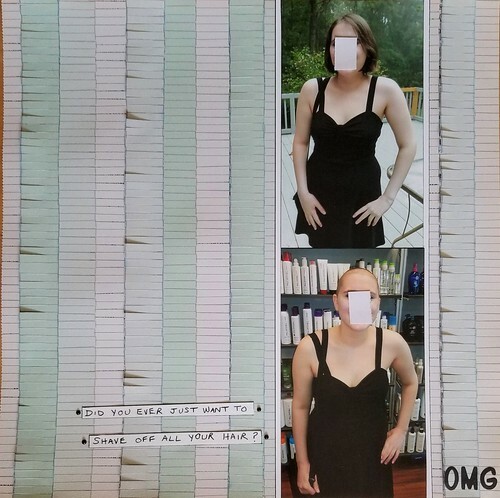 Total: 25. So many things to love about your page, dasmith2 . That you scrapped on your camping trip. That you scrapped that you scrapped! And all the goodies you managed to add to the cluster that represent both these themes! Everyone is so productive that I can't keep up with commenting on each layout. Just know that I think you ladies are all doing beautiful work. jloubier , I can't keep up either! I do try to "like" the posts so they at least know I peeked at them! jloubier, I love your layout. I'm going to see if I can lift it. Looks like I could really use a bunch of stash! I did the 6x6 pad challenge today for 26 points . I saw Jen Schow on u tube cut them diagonally and tried that. Love the greens and blues on your zoo pages, elaynef. And using the map pp and the venue map is a wonderful idea: I love how you use pamphlets and sign photos to set the scene on your pages. The kids looked like they were having a great time.